It’s the middle of the night and you are navigating your way to the bathroom in the dark when, oops, you accidentally kick the foot of the bed. It hurts! Is it broken? Grab some ice and your laptop and make an appointment online for morning with one of our orthopedic surgeons while you R.I.C.E. (Rest, Ice, Compression, and Elevation). 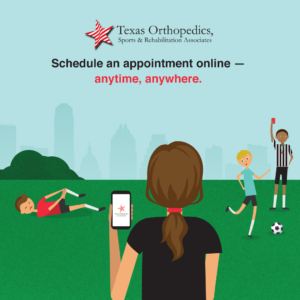 Texas Orthopedics is thrilled to announce our new online scheduling feature where you can make an appointment online, at any time–24/7. Our quick online questionnaire helps identify which specialist is best suited for you, and what appointments are available. You can now make the appointment from the convenience of your mobile device or laptop! Texas Orthopedics is always here for you, and we are dedicated to making sure your orthopedic needs are met and that you’re seeing the right doctor at the right time. We have 35 orthopedic, sports medicine, and physical medicine and rehabilitation specialists in Austin at eight different locations around town to best treat you. Many of our doctors are also fellowship-trained in specialties such as spine care, joint replacement, trauma and fractures, hand surgery, and foot and ankle injuries. Please contact us anytime online to schedule an appointment with one of our specialists right here.